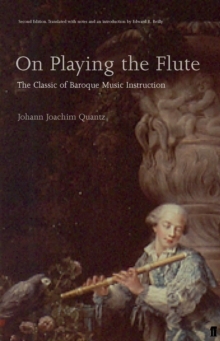 Johann Joachim Quantz's On Playing the Flute has long been recognized as one of the primary sources of information about eighteenth-century performance practice. 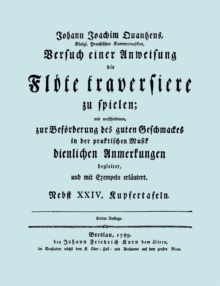 In spite of its title, it is not simply a tutor for the flute, but a fully-fledged programme for training musicians of all types, with detailed information on intonation, ornamentation, dynamics, the 'duties' of the various accompanying performers, including the leader of the orchestra, and the principal forms and styles (French, Italian and German) of the time. 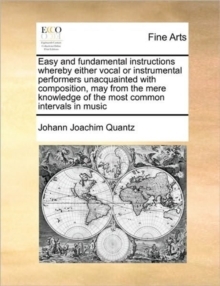 Although Quantz is most often identified as the teacher of Frederick the Great, his musical roots were in Dresden, the most brilliant musical establishment in Germany; and his travels and studies in Italy, France and England gave him direct experience of most phases of European musical life in the 1720s and 30s. 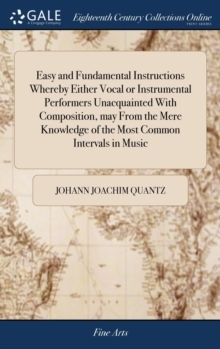 This reissue of the second edition provides a wonderfully complete and detailed picture of musical taste and performance practice in the 18th century, and includes a new introduction by Professor Reilly, drawing attention to recent research on Quantz. Whether you want to learn to play the flute and be taught by the teacher of Frederick the Great, or just to gain a first-hand insight into the history of classical music, On Playing the Flute is an essential and entertaining read.